Part of a resident family group of orca whales (killer whales) traveling through thick fog and mist just off the Hanson Island shoreline in British Columbia, Canada. One of the most challenging but also rewarding task for a wildlife photographer is to photograph a group of orca whales (killer whales) when they are traveling through heavy fog or mist. We found this group of northern resident orca whales with help of underwater microphones (hydrophones) after a long search. Hydrophones don't give direction so all we knew is that orcas were around, not too close, while we were sitting in the water in our little boat. We relocated the boat a few times to get a better idea which direction the whales are moving and finally decided where we would "park" ourselves. We now were much closer and we could hear them actually exhaling not too far away from the boat. Knowing the area helped us to position the boat in a way enhanced our chances that the whales may pass close to us. 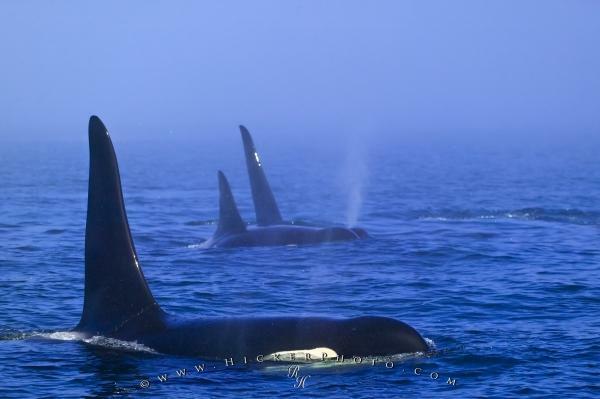 Photo of a group of killer whales traveling through tick fog in British Columbia, Canada. ... It was a very exciting and unique whale watching moment. If you ever got a chance to photograph those beautiful animals in the wild when its foggy I recommend that you switch the auto focus off, if the fog is thick as it was on this day the auto focus can get fooled very easy and you may loose the shot. I probably don't have to mention that I'm very happy with this photograph of a group of northern resident killer whales traveling through the fog, a shot like this was missing in my portfolio, well, not anymore! Two males and one female orca whale, members of a northern resident family group, traveling through heavy fog off the Hanson Island shore in British Columbia, Canada. I photographed this photo with the digital SLR camera model Canon EOS-1DS, aperture of f/6.3, exposure time of 1/800 sec. on ISO 100, as always I used a original Canon Lens, the focus lenght for this picture was 180mm.